​Lecithin is required for proper biological function. 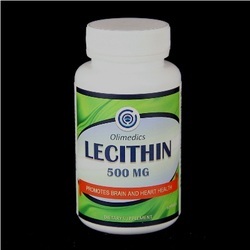 Pharmacological use of lecithin includes treatment for neurologic disorders and dementias. Lecithin is a good source of choline for treatment in dementias. Phosphatidylcholine is thought to be a precursor for acetylcholine (Ach) synthesis. Choline increases the accumulation of Ach within the brain. Ach is important for many brain functions including memory, so increasing concentration of this neurotransmitter may result in improved memory. Taking lecithin seems to reduce the accumulation of fat in the liver of people who are fed long-term through a needle in the vein. It also has been used to modify the immune system by activating specific and nonspecific defense systems. Take 1 soft-gel orally 1 to 3 times daily preferably with meals or as directed by a healthcare professional. CONTAINS SOY (LECITHIN). This product is manufactured and packaged in a facility which may also process milk, soy, wheat, egg, peanuts, tree nuts, fish and crustacean shellfish. KEEP OUT OF THE REACH OF CHILDREN. DO NOT USE IF SAFETY SEAL IS DAMAGED OR MISSING. STORE IN A COOL, DRY PLACE. Do not exceed recommended dose. Pregnant or nursing mothers, children under 18, and individuals with a known medical condition should consult a physician before using this or any dietary supplement.